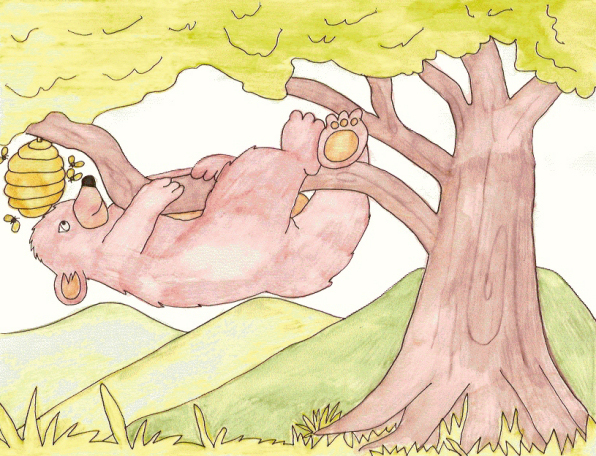 Ricky, the bear, loved to eat honey. He didn't like eating nuts and berries. The only thing he'd eat is honey. He had knocked down so many beehives that there were hardly any left in the forest. A big orange and black bumblebee flew across the river. “It is a bee! I'll follow it.” Ricky chased the bumblebee all the way into the middle of the forest, where it was dark and scary. He didn't notice though because he was too hungry. “There it is. There's the beehive.” Ricky saw that it was high up in the tree. He couldn't possibly reach it from the ground. “I'll have to climb the tree.” He wrapped his legs around the tree trunk and climbed to the branch. “I can't reach it.” The beehive was way at the end of it.